A STROLL around town with a difference greeted the hundreds of people who joined in Saturday’s Knutsford Promenade. Caroline Sherwin guided the tour of Knutsford which told the stories behind just some of the town’s historic buildings with drama, dance and song bringing the past to life. Meanwhile King Street was the focal point for those who simply enjoyed the opportunity to browse round the shops and eat and drink al fresco. In Waterstones, David Briggs, the Lord Lieutenant of Cheshire, UNICEF ambassador Martin Bell, Flight Lieutenant Liam McGuire, Tony Want and Travis Hardy read poetry from the First World War. After Martin Bell delivered his rousing Ode to Knutsford, Roberts Bakery Band treated the crowd to a selection of toe-tapping classics. 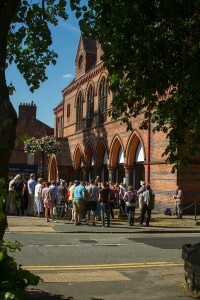 Knutsford Promenades creator and co-organiser Sarah Flannery said: “One of the reasons that Knutsford is a destination town is because of our vibrant heritage and culture and the Promenades lets us celebrate this in new ways,” she said. “The weather – against all odds – was wonderful. “So many people helped to either perform, read or add to the atmosphere by dressing up. I’d like to thank my co-organisers Julie Tempest and Robert Meadows. “Caroline Sherwin not only led the Promenade but also helped select the WW1 poetry for the reading in Waterstones, Clare Pye of Tabey House shared her expert knowledge of Georgian history, the Lions helped to marshal, Geoff Holman gave a wonderful performance as The Gaoler, the dancers from SMB Dance entertained, and LiPA and ActorTribe’s students added to the story-telling and performance mix. “Tony Davies and the Territorial Living History Group helped add authenticity to the elements we included that commemorated the centenary of the start of WW1 and the Knutsford men – we were really honoured that David Briggs, Lord-Lieutenant of Cheshire, Martin Bell, UNICEF ambassador and former BBC war reporter,Tony Want, Royal British Legion and Flt Lt Liam McGuire contributed to this. Sarah Peak of the Cheese Yard said the promenade was a great event for the local community. “The atmosphere on King Street by Cotton Shop Yard was vibrant with an outdoor eating and drinking area whilst people watched the entertainment,” she added. Old Sessions House chef patron David Mooney entertained with a cooking masterclass based on rabbit and allotment vegetables. “It was a joy to behold generations of people enjoying the street theatre of the Promenades,” David said. LORD Lieutenant David Briggs said the Knutsford Promenade was a special community event. “With its focus on the Commemoration of the start of World War One, it really brought home how every street in the country was affected by the War,” he said. “Amongst the residents of King Street ten people lost their lives. Martin Bell said it was such a pleasure to return to Knutsford for the Promenades. “Nowhere else does anything like it,” the former MP for Tatton said. Knutsford Town Mayor Clr Neil Forbes said the Promenade was ‘a wonderful blend of culture, history, entertainment, tribute and fun’. “A Promenade alone would have been fun but it was the readings, tableaux and performances which made it so special and unique,” Clr Forbes said.